Granny Smith apples have achieved huge commercial popularity and are instantly recognised by their bright green skin and tart, tangy flavour. The best thing about growing your own Granny Smith apples at home is that the flavour is much improved if you allow the fruit to fully ripen on the tree, something that cannot be achieved with store bought apples. Granny Smith apples are perfect for eating fresh or using in both sweet and savoury salads as they do not brown as quickly as other apple varieties. They also taste great in home cooked pies - a tip for cooking with Granny Smith apples is to use slightly under-ripe fruit as the slices keep their shape better. They are one of the best apples for home storage. 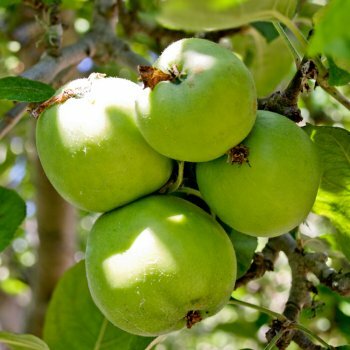 Being self fertile, Granny Smith apples trees are the perfect choice for planting in your garden as they doesn't need another tree to pollinate. The tree will grow to an easily manageable 3-4m in 10 years time. Named after Mrs Anne Smith from Ryde, New South Wales Australia, the Granny Smith apple tree is thought to be an unintentional hybrid of Malus sylvestris and Malus domestica. Granny Smith doesn't require a pollinator, so only one tree is required. If you do wish to plant multiple fruit trees, you will need to take the rootstock into consideration. An apple tree on a MM106 (semi-vigorous) rootstock will require approx. 4.5 metres between trees, whereas one on a M27 (very dwarf) rootstock will require approx. 1.5 metres between trees. Our pot grown Granny Smith apple trees can be planted at any time of the year but bare root ones need to be planted between November and March. Remove weeds and grass within a metre of your desired planting hole then dig a hole slightly deeper than your root mass and approximately 3x as wide. To help your tree establish more effectively, apply root grow. Gently loosen the roots and place into the planting hole. Using 50% of the original soil and 50% compost, fill in the hole and firm around gently. Make sure not to bank the soil up around the collar of the tree. We recommend planting fruit trees using a stake and tie and a rabbit guard.